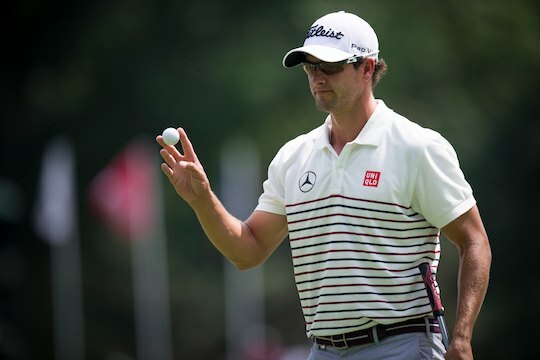 Adam Scott fired an opening 5-under-par 65 to lead the PGA Championship with American Jim Furyk at Oak Hill Country Club after play was suspended for more than an hour due to inclement weather. Scott started his run with a birdie at the par-5 fourth and went on to birdie the next four in a row before a par at the ninth gave him a 30 for the front nine and a share of the lead. At one stage Scott looked on track to match the course record of 64 shared by Ben Hogan and Curtis Strange, but a bogey at the 16th damaged his chances. A solid par saving putt on the 18th kept Scott with a share of the lead in a round that included six birdies and one bogey. Ultimately, it was Scott’s putting which kept his round going. “The putt on the first steady my round,” said Scott. Aside from Scott’s pure putting exhibition today, his ball striking was another standout feature in what really was a peerless round by the Masters champion. 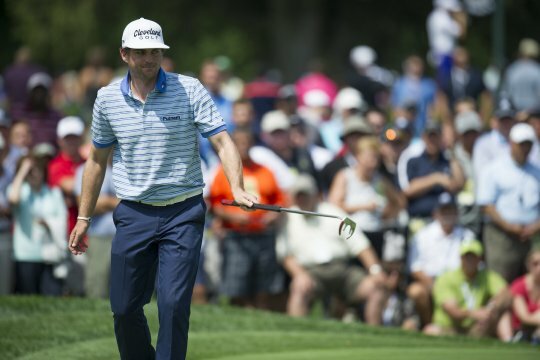 “I stiffed it close on eight and then followed that with another birdie on nine,” said Scott. Furyk, the 2003 US Open champion, has not won since the 2010 Tour Championship but the 43-year-old American fired six birdies as he pursues his 17th career title. Woods, a 14-time major winner seeking his first major title since the 2008 US Open, closed with a double bogey at the par-4 ninth to finish on one-over 71. “I’m still right there,” said Woods. Overall for the Australians it was a successful opening day. Marcus Fraser is at 3-under and in a tie for 5th position along with Jason Day. Fraser was out early and took full advantage of the conditions. Day also found scoring easy on this tight but rewarding Oak Hill layout. “It was solid,” said Day about his round. “The greens are very receptive and it was not surprising that the guys were shooting low. I was just happy with a 67 today. Rory McIlroy fired a 1-under-par round to be in a tie for 22, one ahead of Marc Leishman, who is currently the next best Aussie behind Day. Brett Rumford opened with an even par 70 and finished the day in 36th position, John Senden is at 2-over and in a tie for 74, with Matt Jones at 2-over. Geoff Ogilvy opened with a 74 to be well down the leaderboard and will need a stellar round tomorrow just to make the weekend.